A dark coating on some geological features of Jupiter's icy moon Europa are likely sea salt deposits, according to a new report from NASA's Jet Propulsion Laboratory. Researchers suspect that the salt comes from a subterranean ocean, opening up possibilities that the moon could support life. "We have many questions about Europa, the most important and most difficult to answer being is there life? 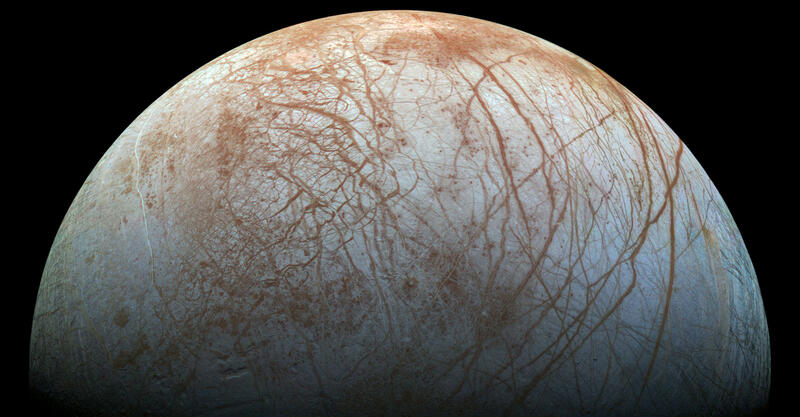 Research like this is important because it focuses on questions we can definitively answer, like whether or not Europa is inhabitable," said NASA scientist Curt Niebur in a news release. "Once we have those answers, we can tackle the bigger question about life in the ocean beneath Europa's ice shell." Europa is subjected to heavy radiation from Jupiter's magnetic field; researchers believe that said radiation is responsible for the dark discoloration of the salt on the moon's surface. To test their theory, NASA scientists simulated the surface of Europa in a laboratory, which they called "Europa in a can", to investigate radiation's impact on the salt deposits. The longer the salt was subjected to radiation, the darker it became. With abundant liquid water, this moon of Jupiter may have seas with life forms not so different from those on Earth.